The Electric Umbrella is the large, quick service restaurant in the center of Epcot's Future World. 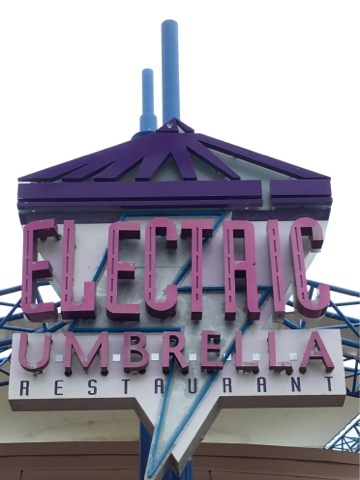 At first glance, there is nothing that stands out on this sign. However, if you zoom in and look closely, you will see a very small hidden Mickey near the top. 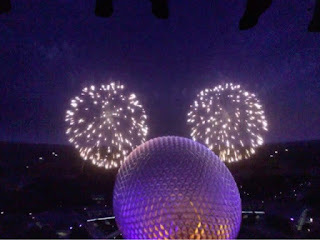 I took this shot yesterday, while giving an Epcot tour. The American Adventure in Epcot is one Walt Disney World's best "productions." It is more than just a show. There are interesting things to look at in the pre-show area, including these flags. 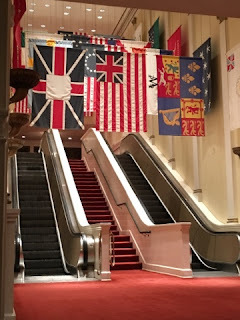 They are flags found throughout the history of America. They can be seen while riding the escalator up to the theater. Spaceship Earth will always be one of my favorite attractions. 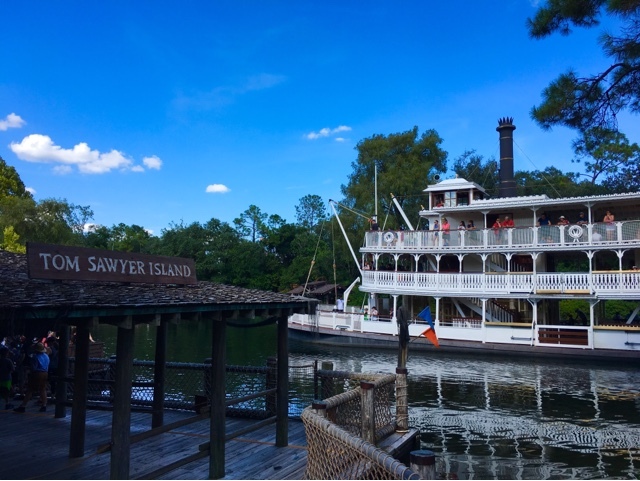 It is a classic in every sense of the word, and still brings me back to the great Walt Disney World vacations of my youth. 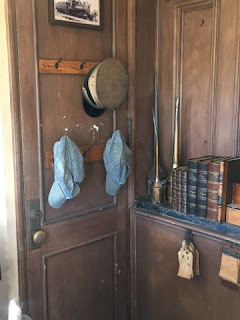 There are several fun hidden Mickey's in this attraction, and you can see one of these in this photo. There are three white paint circles on the table of this Renaissance painter scene. I have taken hundreds of pictures of Cinderella Castle over the years, but most of them are in daylight. 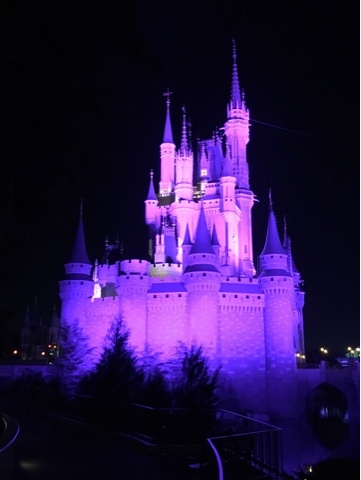 Tonight, however, I was able to get this shot on the pathway from Liberty Square to the area behind the castle. They certainly use very blue lighting this time of night. There are many fun things to explore when on Tom Sawyer's Island, but there are a few things that can only be seen when riding the Liberty Belle river boat. One of those things is Wilson's Cave Inn. 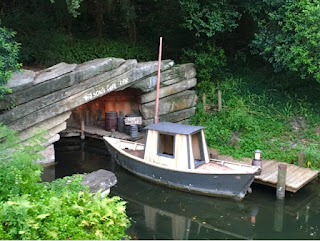 This "alcove" appears to be a hideout for river pirates. I took this shot yesterday while riding the boat. 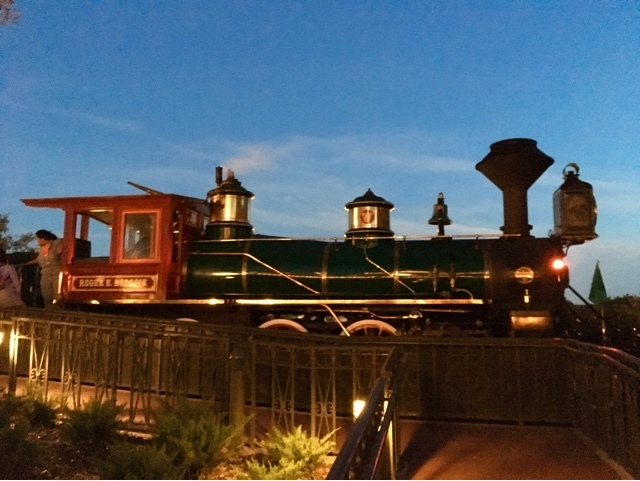 I spent some time riding the Walt Disney World Railroad tonight with our son. This is a favorite attraction in our family, and we ride whenever possible. 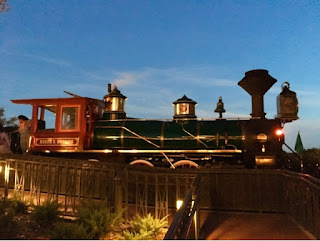 I took this shot at sunset, shortly after riding the train pulled by the Roger Broggie steam engine. 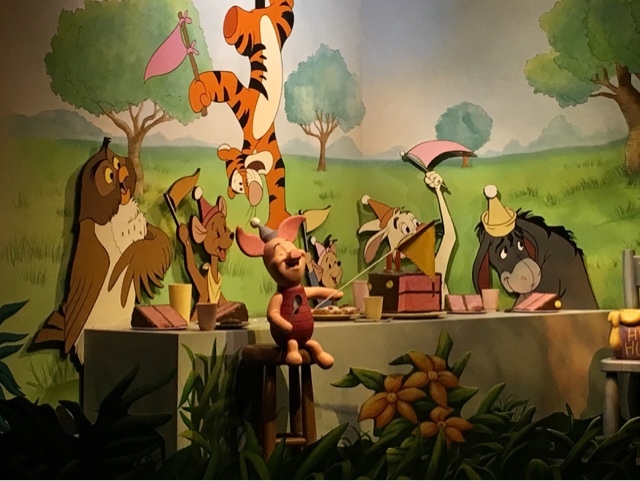 The Many Adventures of Winnie the Pooh is a classic "dark ride" in every sense of the term. 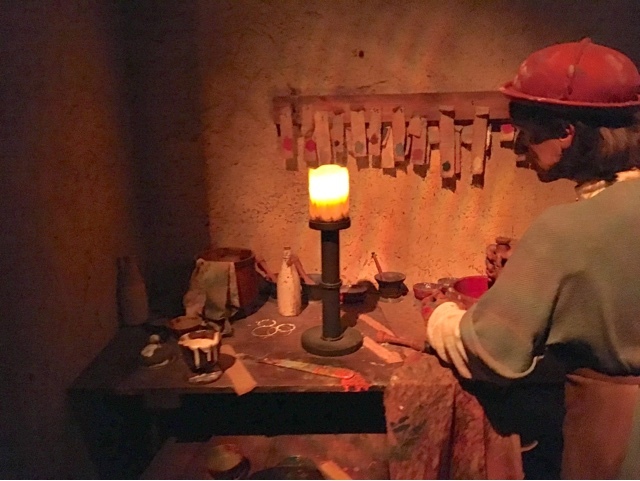 Unfortunately, because of the low light levels and movement of the ride vehicles, it is often difficult to get good photos. 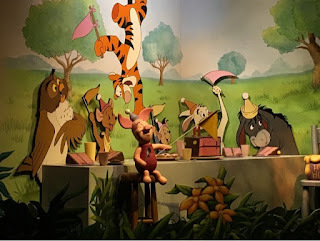 However, when my honey pot stopped briefly a few days ago, I was able to snap a clear picture of the birthday scene. 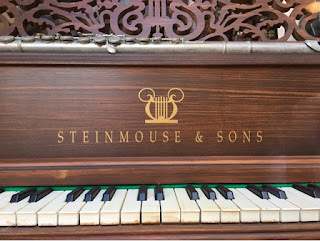 While looking at some of the details in the Emporium windows on Main Street today, I came across this beauty. It is located across from Center Street, under a sign labeled "Collectibles." I like the nod to the Steinway piano company, as well as the hidden Mickey music stand. 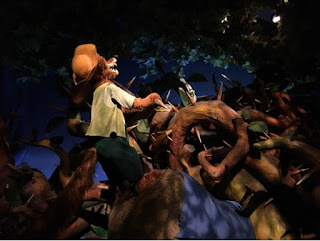 I don't often get photos while riding Splash Mountain, due to the high risk of getting my phone wet. However, I was able to snap this shot near the end of the ride today. After the big drop, things remain relatively dry, and my fear of water damage is lessened. I had the chance to take a few pics at the Polynesian Village Resort this morning. I was on the beach, looking toward the boat dock. 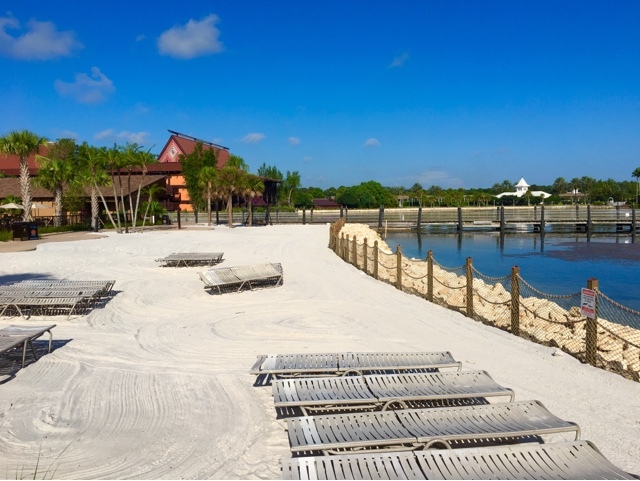 You can see that the new fence is complete, which will keep guests from entering the water. 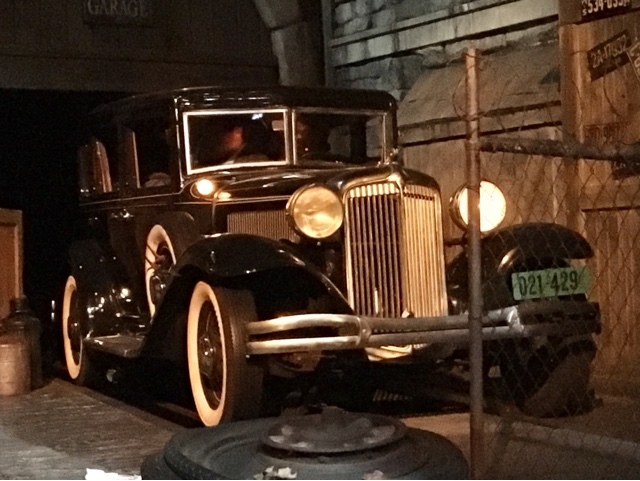 The only attraction at Hollywood Studios still left from opening day in 1989 is The Great Movie Ride. This classic attraction has had some updates to the narration and the movie mantage at the end of the ride. However, most of the physical scenes have remained unchanged. One of my favorites is the gangster scene. 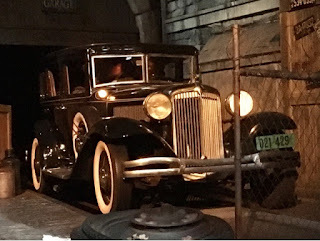 A little detail that most guests miss is the license plate number on the car. It references the date of the St. Valentines Day Masacre. I took this shot this afternoon. I enjoy visiting the Japan pavilion at Epcot, whenever I get the chance. There is good food, interesting exhibits, and a large store. 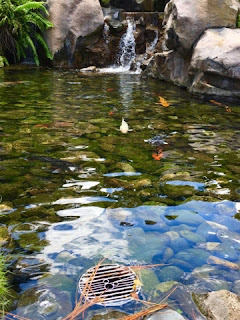 There is also a Koi pond with a fun hidden Mickey, that you can see in this shot. The actual Space Mountain "ride" only lasts about 2 1/2 minutes. However, there is much more to this experience than just the ride itself. The walk through the entrance tunnel really sets up the attraction with music, 3D images, and even video games in the queue. Then, after the ride, there is the long moving ramp that takes you to the giant gift shop. Along that ramp, you will see several displays from across the universe. 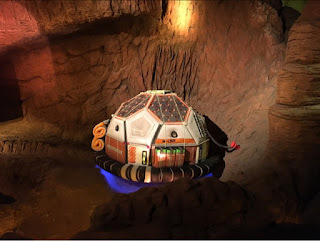 This shot shows a module being used to explore some space caverns. Disney doesn't often build "new" dark rides, but the relatively recent addition of Under the Sea – Journey of the Little Mermaid, is the exception. 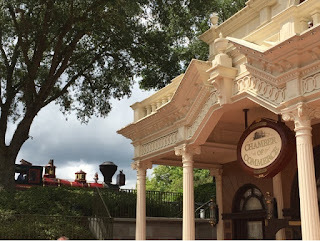 This attraction opened in 2012, and has the feel of some of the classics. 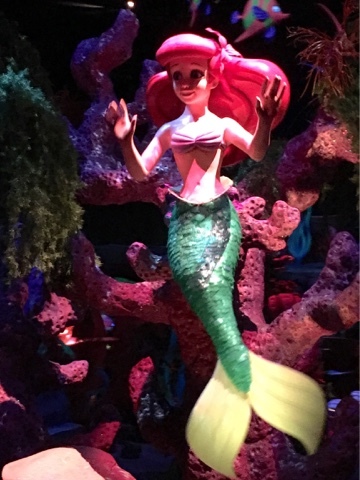 I took this shot of Ariel a few days ago, while riding by in my giant clamshell. Peter Pan's Flight is one of my favorite attractions. 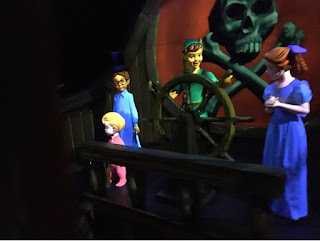 Unfortunately, it is very difficult to take good pictures in this classic dark ride, due to the low light levels. However, yesterday I was able to take a pretty decent one near the end of the ride. 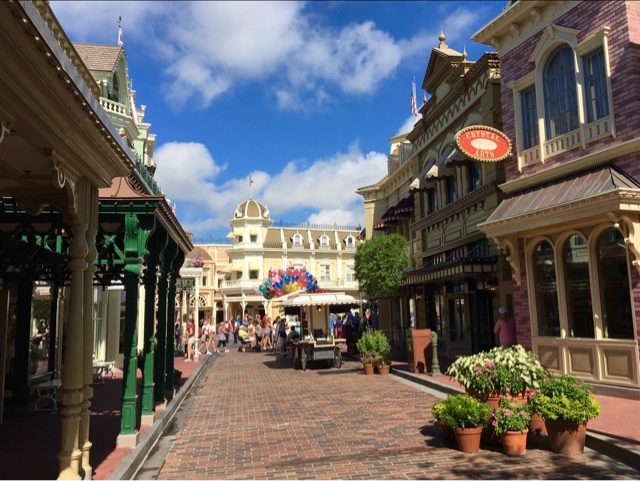 One of my favorite spots in the Magic Kingdom is Center Street. 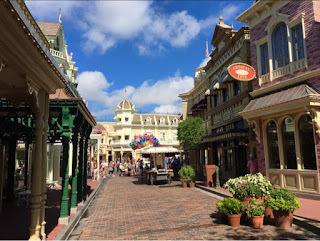 It is so close to the crowded area of Main Street, USA, but is a quiet spot to take a break. Today was a beautiful day in Central Florida, and it made for some nice photo opportunities. This is a fun sign that can be found near the Disney Vacation Club kiosk in Frontierland. 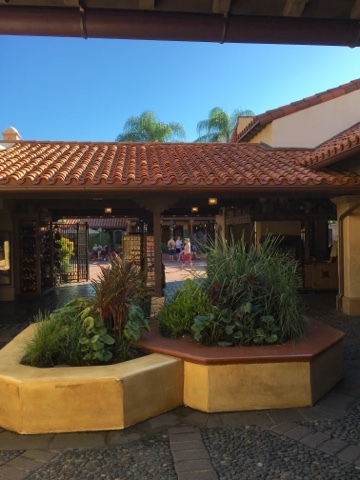 This area is themed to a stagecoach depot, and the sign fits right in. Most guests don't stop to read it, but those who do can have a chuckle. You will notice that the words start out large, and they are describing the positive aspects of this particular stagecoach line. However, as the letters get smaller, the information gets a little more ominous. The tiniest print ends with the words "unexpected fatality." As summer is coming to a close, I am looking back at fun photos I have taken over the past few months. I took many at the 4th of July Fireworks displays at both Magic Kingdom and in my town of Celebration. 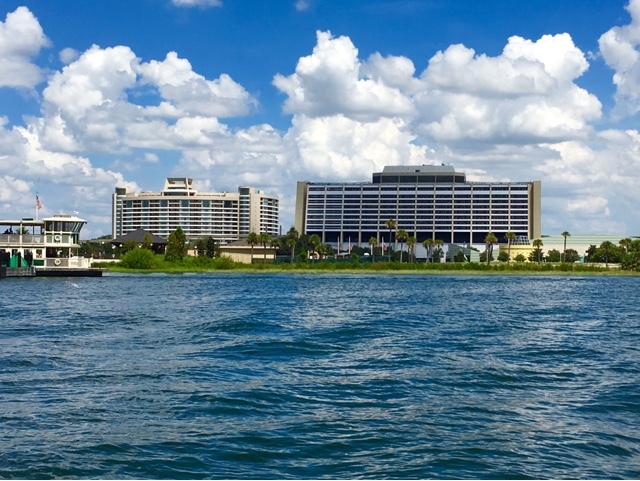 This is one of my favorites from the view I had at The Contemporary Resort. One of the busiest areas of the park, with the most overlooked details, is the Main Street Railroad Station. From the architecture, to the paintings, to the sounds, this building takes you back to the late 19th century. I took this shot thru the window of the 2nd floor ticket booth. You can see conductor and engineer hats, oil cans, and even encyclopedias from the late 1800s. Here is an exterior shot of the new Tiffins restaurant at Animal Kingdom. 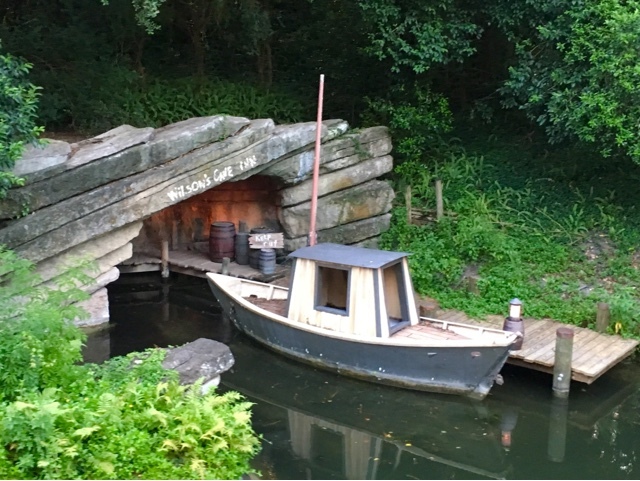 Right now, it is tucked back behind Pizzafari in a quiet area of Discovery Island. However, once the new Avatar area opens next year, this will be a very busy pathway, without a doubt. Although you can only see part of The Land in this shot, it is a huge pavilion at Epcot. At over 6 acres in size, it is actually larger than all of Tomorrowland in the Magic Kingdom. 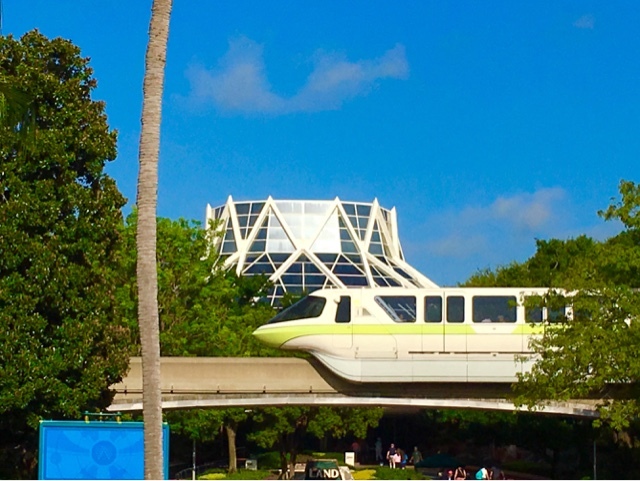 I timed this shot as the monorail was passing by. 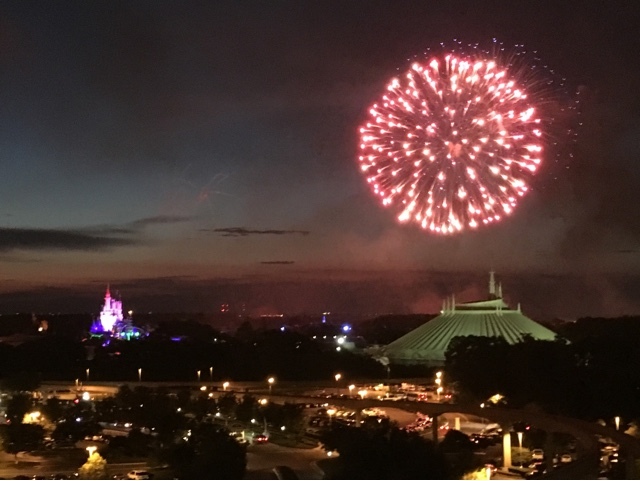 Although much has changed in this park since it opened in 1982, this view is similar to what you would have seen 34 years ago. 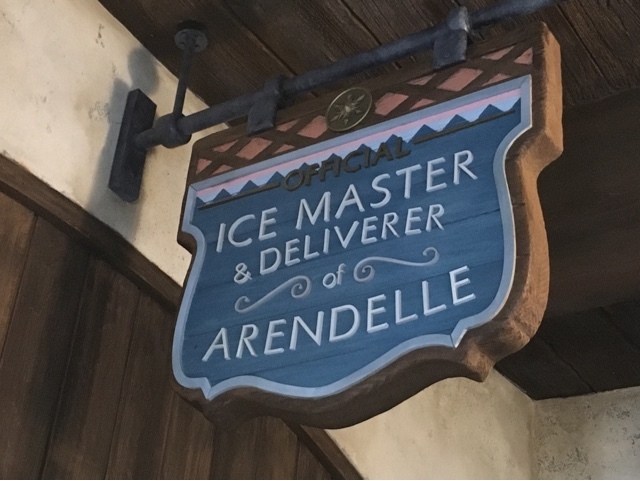 Recently, the Anna and Elsa meet-and-greet moved from Magic Kingdom to Epcot. 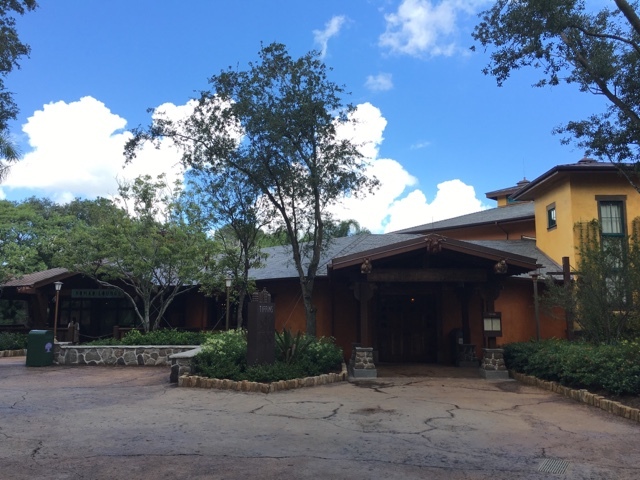 The Royal Sommerhus was built adjacent to the Norway pavilion, and is supposed to be the sisters' "summer home." I took this picture just inside the entrance of the queue. As always, Disney did a great job on the theming of this new area. 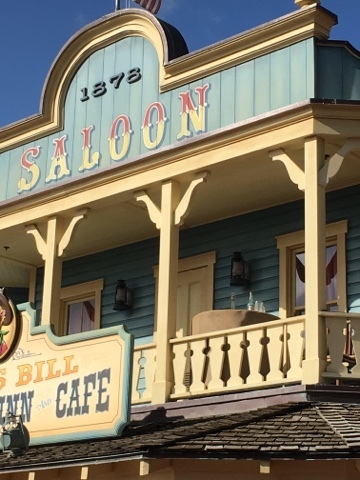 Even though there is no actual alcohol served in Frontierland, I love the authenticity of this picture. Pecos Bill's is a quick service restaurant on the inside. However, the exterior has that "saloon" look. If you look closely, you can even see liquor bottles on the table. Restaurantosaurus is a quick service spot in Dinoland USA at Animal Kingdom. As the story goes, professors and grad students, from the nearby Dino Institute, turned this old lodge into a makeshift dormitory. They needed a place to eat so they added this cafeteria, which was also open to the public. 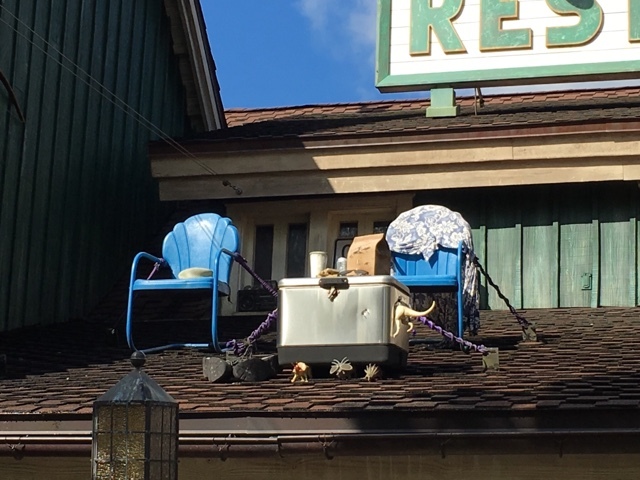 Apparently, some students would take a break in these chairs, found on the roof near the entrance to the restaurant. One of the greatest character greetings to come along in quite a while has been the "talking" Mickey. 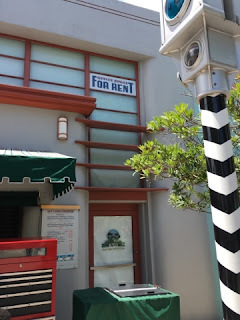 He can be seen each day in his dressing room in Town Square Theater. 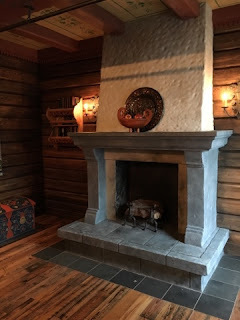 This shelf, on the wall across from where he stands, has some fun hidden meaning that most guests totally overlook. The objects actually represent the four theme parks of Walt Disney World. On the far right, you have the Sorcerer Mickey hat, which relates to Hollywood Studios. Next, there is a box with leaves and a bird, which corresponds nicely to Animal Kingdom. The crystal ball shares the same shape as Spaceship Earth at Epcot. 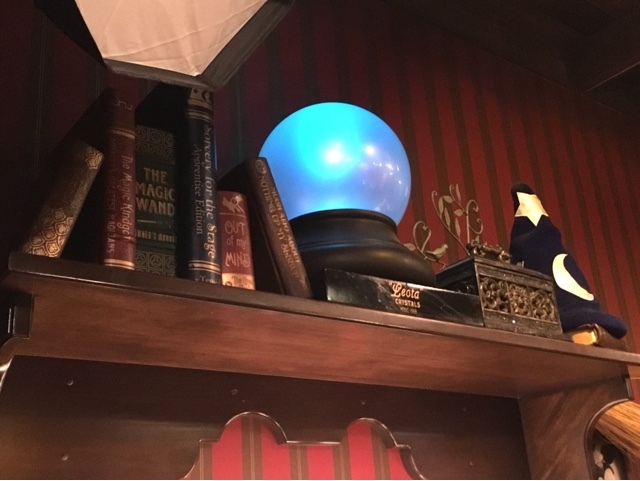 Finally, all of the books have to do with magic, of course giving a nod to the Magic Kingdom. Many Disney attractions exit through a gift shop, which is typically themed to that attraction. Pirates of the Caribbean falls into this category. Most of this shop is indoors, but there is this little "courtyard" that has no roof. I took this shot early in the day, before the large crowds arrived.